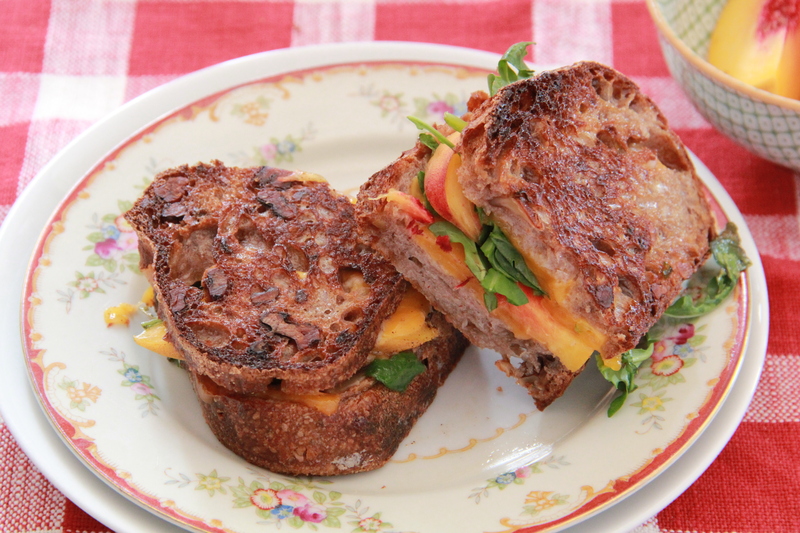 Let’s get right to the point here: you don’t need me to give you a recipe for grilled cheese. You also don’t need an extra thick coffee milkshake, but wouldn’t your day be better if you had one right now? Sometimes we want things that we don’t need. Like milkshakes and pie cutters shaped like acorns and recipes for grilled cheese. I had this for lunch two days in a row. We’ve been lucky enough to still have some peaches at the farmer’s market (slim pickings, but I’m holding on to peach season with white knuckles), though I imagine this would be just as delicious with pears or apples, or even sweet plums. And if you’re looking for a comfy tomato soup recipe to round this whole thing out, I’d suggest a hearty bowlful of Moroccan-spiced tomato soup. Yum. I’ll let you in on a perfectly toasty tip: the secret to any good grilled cheese is coating the bread with mayonnaise instead of butter. Learn it and live it, happily-perfect-grilled-cheese-ever-after. Smear both sides of each slice of bread with a thin layer of mayonnaise. Lay a slice of cheese on each piece of bread. 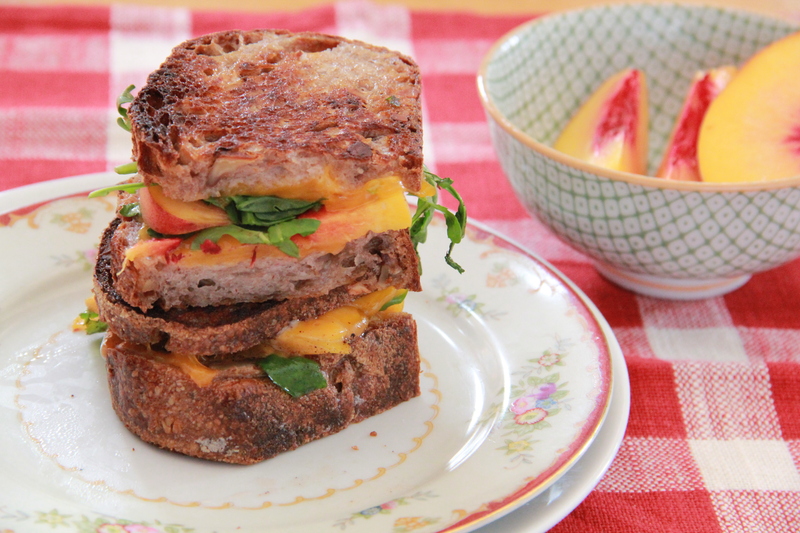 Layer the peach slices and arugula on top of one piece of bread, and top with the remaining piece. Melt the butter in a small skillet over medium heat. Place the assembled sandwich in the pan, and press it down firmly with a spatula, or a too-small lid. Cover the pan with a lid or plate, and let the sandwich cook and get melty for about 2 minutes. Flip the sandwich carefully, press it again, and cover it to finish cooking, about another 2 minutes. Remove when the bread is toasted and the cheese is good and melty. Cut in half and enjoy immediately. 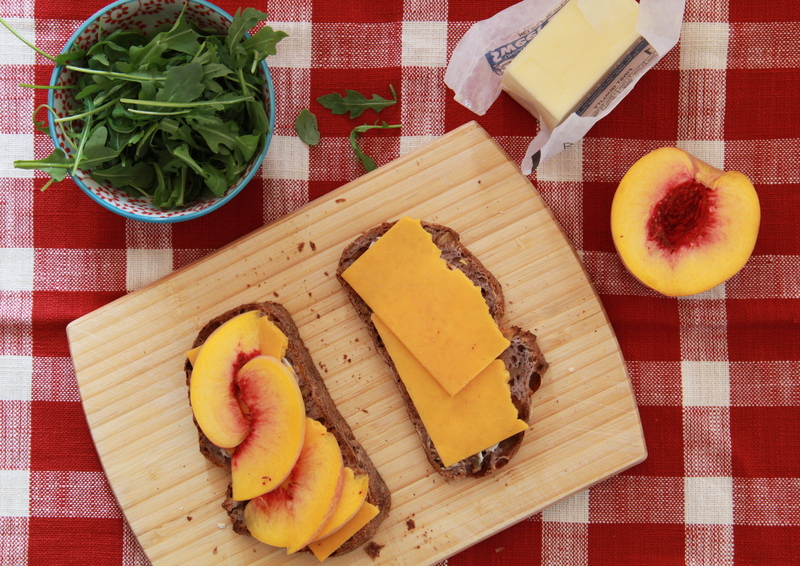 I love ingredients in this sandwich: peach, arugula. I will try it in my new panini press!